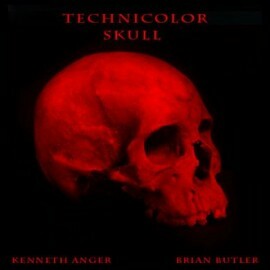 Technicolor Skull’s self-titled recorded debut, a one-sided, bloodred 180 gram 12” vinyl LP limited to 666 copies. Technicolor Skull is an experiment in light and sound, exploring the psychic impact of a magick ritual in the context of an improvised performance. With Brian Butler on guitar and electronic instruments, and Kenneth Anger on theremin, their collaboration is a performance contained inside a ritual of unknown origin, tapping into occult stories that extend musical language into initiation. Hidden messages escape through gesture and light, manifesting as a one-time-only event.